Hi Friends!!! Welcome to my stop on the Altenew “Celebrating Parents Card Drive" blog hop! You should have arrived here from Laura Volpes page. So what is this card drive about? 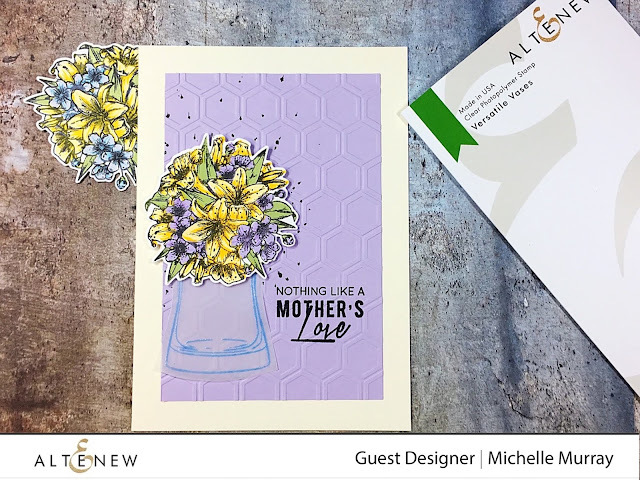 Altenew has a goal to send cards to the elderly that live in nursing homes or shelters to let them know they’re not forgotten. How incredible is that? You can read all the details here. I hope you will consider joining this great cause by sending in cards. 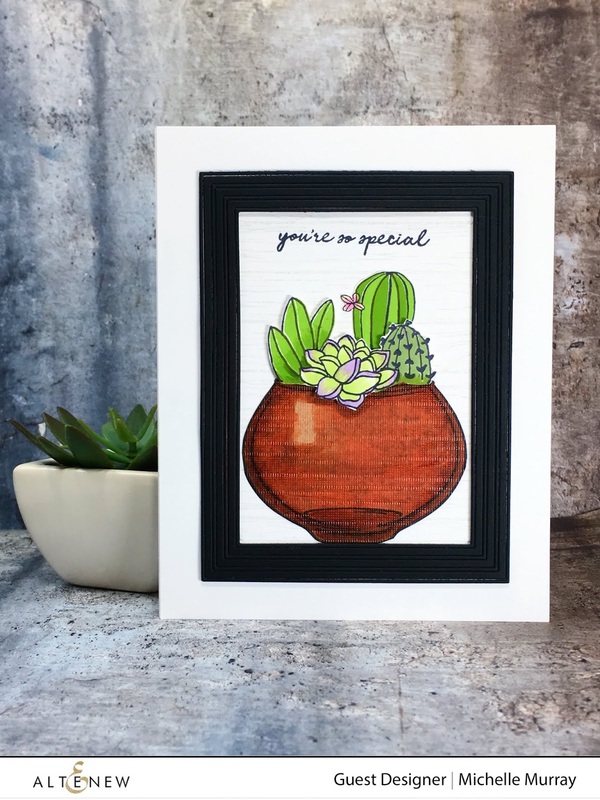 20% of the profits earned from select stamp sets (Best Dad, Painted Rose, Extra Special, Lotus, Cross Stitch Flower, and Best Mom) by 6/16/2019 will be donated to the Food Bank of Central New York to support seniors in need. Now on to a little inspiration! For my first card I used the Versatile Vases set along with the Build-A-Flower: Cattleya set. I decided to decorate my vase with Watercolor Strokes Washi Tape. I applied the washi tape to a blank piece of cardstock, then using Black ink I stamped the image onto the washi tape and then heat embossed it with clear embossing powder and cut out. I stamped the flowers using the Cherry Blossom ink set and used the coordinating die to cut them out. Using the Fine Frames Cover Die I took the two largest frames and cut them at the corners to add some visual interest. 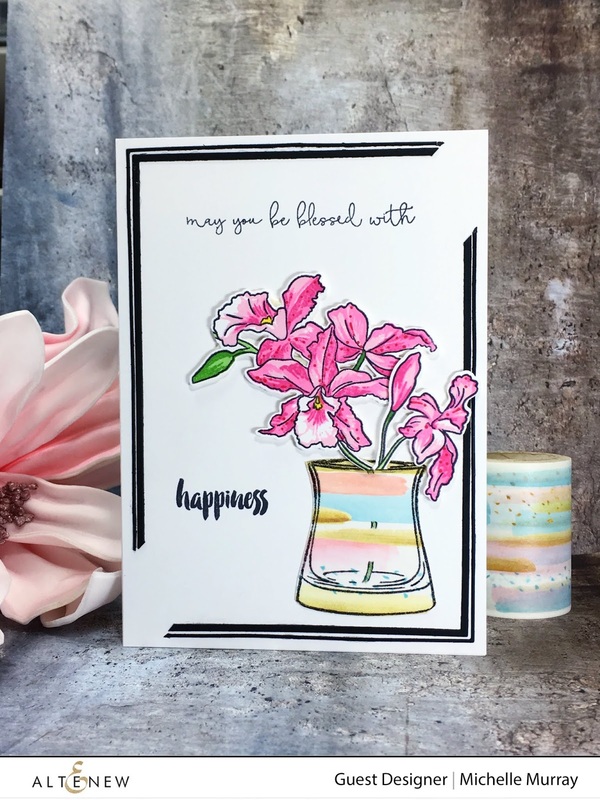 The sentiment comes from the Celebrations stamp set. For my second card I again used the Versatile Vases but wanted to create a succulent set so I cut the vase from colored cardstock. I added succulents from the Indoor Garden layered set and colored with the new Spring Bouquet inks. I added a little texture to the interior frame space with the Wood Pallet Background stamp set in Limestone ink before framing it with the Fine Frames Cover Die. The sentiment comes from the Versatile Vases set. I think this makes a good masculine Father’s Day card. Card number three also uses the Versatile Vases set, however the Prettiest Pomander flowers crown the simple vase. I heat embossed the vase onto vellum to give it the look of frosted glass. 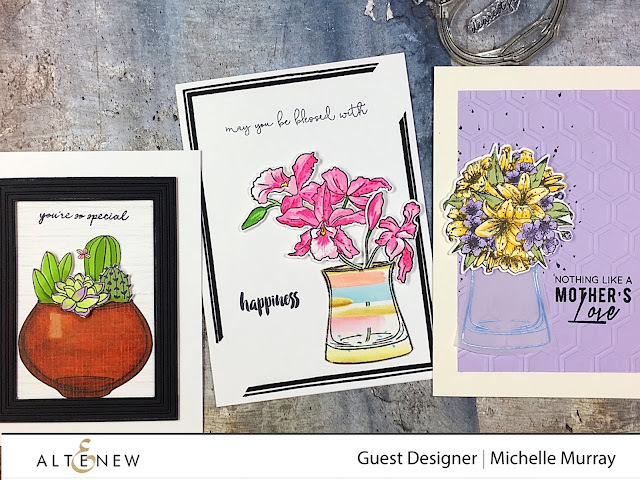 I stamped the image using Summer Afternoon and Shades of Purple ink sets. Finally, the sentiment comes from the Wild Hibiscus set. I hope I’ve given you some inspiration! Next on the blog hop is Terri Koszler. Good morning! 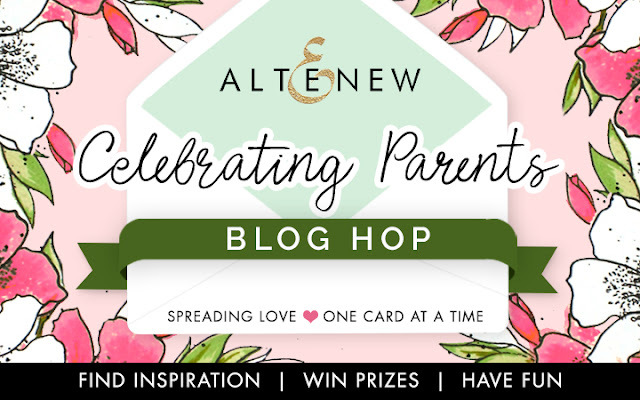 I am popping in to announce the blog-hop winner of the $15 gift certificate from the Altenew Educator Blog Hop and giveaway. Denise please contact Altenew at winner@altenew.com by 1/31/2019 with the subject line Altenew Educator’s Blog Hop Winner from Michelle Murray’s Blog. Thank you all for your very kind and encouraging comments, they truly put a smile on my face!